Luxury in the heart of the Indian Ocean. 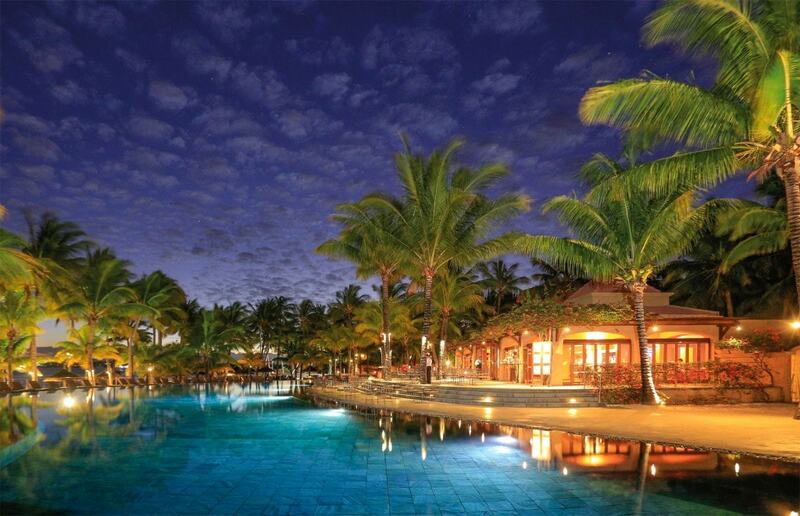 Mauritius Le Mauricia is set in a lively location, a short walk along the beach to the bustling village of Grand Baie. Make the best of both worlds, enjoying the excellent facilities offered by Le Mauricia and the shops, nightlife and restaurants found in Grand Baie. All rooms are ocean-facing and have partial views over Grand Baie from a private terrace or balcony. The Family Apartments are located within the gardens with garden views. For honeymooners there’s a choice of three honeymoon suites which come with their own plunge pools. In-room facilities include: Individually controlled air-conditioning, private bathroom with bath or shower and separate WC, minibar, safe, hairdryer, television (satellite channels, music), international direct dial telephone. Additional nights may be added. Choice of Bed & Breakfast, half-board or All Inclusive. 2 restaurants and a pool bar surrounded by 2 infinity pools. 3 flood-lit tennis courts and a volleyball court. The average temperature is 27° centigrade during the day and rarely under 20° at night. There are two seasons, hot from November to April and warm from May to October. The Standard Rooms are located on first and second floors of the hotel. The Superior Rooms are located on the ground floor and are larger than the Standard Rooms. 28 two bedroom Apartments are set within the gardens and have their own unique features including private garden. Make your honeymoon extra special by staying at one of Le Mauricia’s 3, top floor, romantic Honeymoon Suites. There is one exclusive 2 bedroom villa at Le Mauricia. The villa has its own private plunge pool. LE MAURICIA HOTEL – 7 Nights Half-Board with free lunches – from £1,122 per person inclusive of flights. Book early and save 20% off your accommodation costs. Bookings must be made at least 30 days prior to travel. Celebrate your honeymoon at Le Mauricia and save 30% off your accommodation costs. Applicable to all rooms except Family Apartments, Loft Suites and Villas. Enjoy your anniversary at Le Mauricia and save 30% off your accommodation costs. Applicable to all rooms except Family Apartments, Loft Suites and Villas. Applies to every 5th years Wedding Anniversary which must be within 6 months of arrival date at the hotel. Infants (0-5 years) stay FREE on the same board basis as their parents when sharing parent’s room. 1 child (6-17 years) stays FREE on bed & breakfast when sharing parent’s room.